Aztec Fuji (DT-2 cv) Lady in Red U.S.P.P. # 18787 ® Aztec Fuji (DT-2 cv) ® Royal Red Honeycrisp (L J -1000 cv.) U.S.P.P. # 22244 Royal Red Honeycrisp (L J -1000 cv.) U.S.P.P. # 22244 Red Rubens U.S.P.P. # 14177 Red Rubens U.S.P.P. # 14177 Lady in Red U.S.P.P. # 18787 F A C E S O F T H E F U T U R E ® Number 1 Red Fuji planted today. Its red blush is the color standard for all Red Fuji selections, even in areas where color is difficult to obtain. A Gala/Elstar cross from Italy that combines intense flavor with a pleasing, juicy, sweetness that's wrapped in an appealing scarlet package. 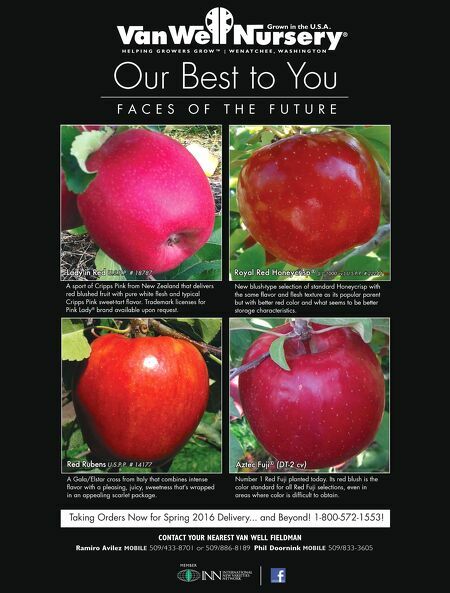 New blush-type selection of standard Honeycrisp with the same flavor and flesh texture as its popular parent but with better red color and what seems to be better storage characteristics. A sport of Cripps Pink from New Zealand that delivers red blushed fruit with pure white flesh and typical Cripps Pink sweet-tart flavor. Trademark licenses for Pink Lady ® brand available upon request. Taking Orders Now for Spring 2016 Delivery... and Beyond! 1-800-572-1553!